Following an early-month shot of wintry weather, conditions warmed up while we also chipped away at the ongoing drought. Click any underlined heading in the graphic to read more about that topic, or scroll down to read our full climate summary. Despite seeing some of the coldest temperatures in nearly three years in the wake of a snow event early in the month, last month as a whole was a bit warmer than normal. The statewide average temperature of 44.65°F was about 5 degrees above the long-term average from 1981 to 2010, ranking as the 19th-warmest January since 1895. That shot of cold air came in the wake of the first winter storm of the season on January 6-8. Snow on the ground and clear skies overhead allowed temperatures to dip into the single digits across the northern Piedmont and even into the negatives in some outlying areas. After that, though, conditions warmed up thanks to a steady southwesterly upper-level flow. Temperatures routinely reached above-normal levels, and many sites went more than two weeks without dropping below freezing. That included 16 consecutive days with above-freezing temperatures in Raleigh, Greensboro, and Charlotte. In Raleigh, that's the 4th-longest wintertime streak of above-freezing temperatures on record; the longest is 20 consecutive days ending on February 3, 1974. The final month of meteorological winter is now here, and you don't have to wait to hear from the groundhog to get a sense of the upcoming conditions. 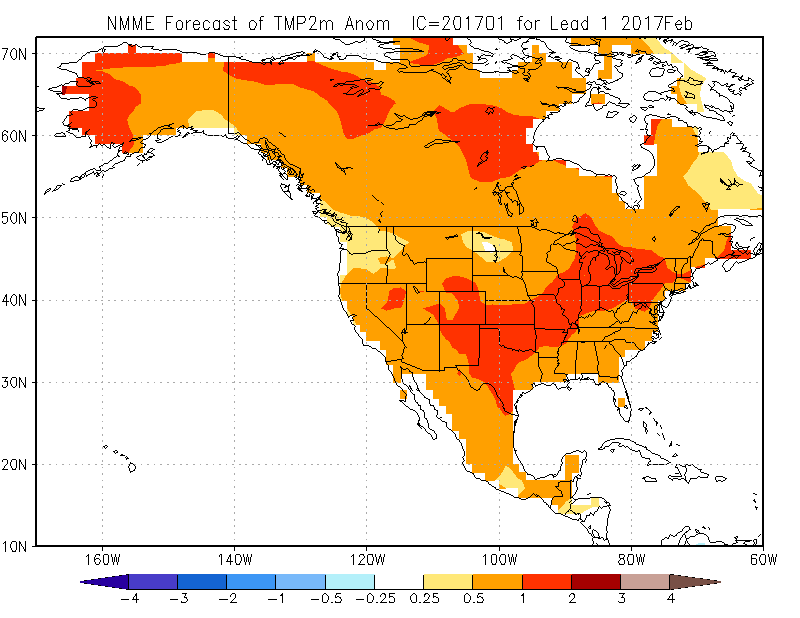 Most climate model forecasts agree that much of the country should see above-normal temperatures continuing into February. Although that doesn't rule out another quick shot of cold or wintry weather like we had in early January, the prevailing pattern seems likely to be a warmer one. That shouldn't be too much of a surprise. In our Winter Outlook from November, we noted that past years with similar fall conditions tended to have most of the cool and wintry weather concentrated in the first half of the winter before transitioning to a predominately warmer pattern. Rain, snow, and a mixed bag of wintry precipitation all fell across the state last month, which was on the wet side of normal overall. The statewide average precipitation of 4.18 inches ranks as the 42nd-wettest January out of the past 123 years. That's about 0.25 inches wetter than the average January precipitation from 1981 to 2010. Three main events were responsible for most of that precipitation. The new year began with a statewide rain event that saw at least an inch in most areas and more than 2 inches across the Piedmont, which had been classified in Abnormally Dry conditions by the US Drought Monitor. A few days later, a low pressure system brought in moisture from the Gulf of Mexico, and with air temperatures hovering around the freezing mark, parts of the state saw their first wintry precipitation of the season. More than 8 inches of snow fell across the northern and western Piedmont, while precipitation transitioned to sleet and freezing rain to the south and east. Along the coast, it was mainly a rain event. The third major precipitation event began on January 20 as a strong low pressure system crossed the southeast. While that meant some notable readings on the barometer -- more on that below -- it also wetted rain gauges across the state. Parts of the mountains received more than 3 inches of precipitation, with totals decreasing to half an inch or less along and east of the I-95 corridor. Although that part of the central Coastal Plain missed out on heavy rainfall during the month, the precipitation elsewhere put a dent in the ongoing drought. The Mountains saw a categorical improvement in drought conditions, with the northern Mountains now falling out of drought altogether. Abnormally Dry conditions have largely disappeared across the Piedmont thanks to the precipitation in all its forms over the past month. US Drought Monitor maps for North Carolina on December 27 (left) and January 24 (right). Sea level pressure values in Taylorsville from January 21-24, 2017. As that low pressure system moved across the state on January 22 and 23, we felt the pressure, or lack thereof. That same system was responsible for producing tornadoes across the deep south, and while impacts in North Carolina were largely limited to rain and some gusty winds, we did see some large pressure drops as the still-strong system passed through. In this event, the center of the low crossed the Foothills so the lowest pressure readings came in that region. 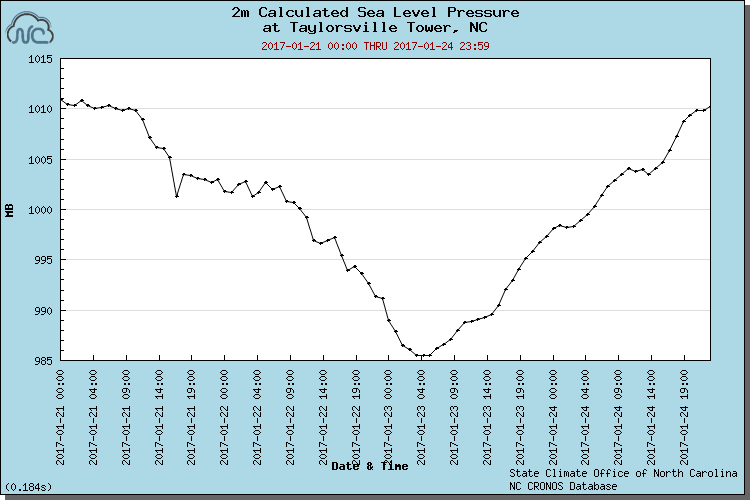 At our ECONet station in Taylorsville, the sea level pressure dropped down to 985.18 millibars at 5:22 am on the 23rd. Nearby Hickory reported a minimum sea level pressure of 985.7 millibars. Elsewhere, most locations reported sea level pressure values of a little under 990 millibars. Pressure readings that low are a rare occurrence that we generally see only with hurricanes and Nor'easters along the coast. Although this event didn't rival the record low pressures across the Piedmont from the "Storm of the Century" in March 1993, last month's low pressure values were a surprising occurrence given the otherwise minimal impacts.